This delightful holiday house is a character farmhouse, a 16th-century baronial hunting lodge, set in 10-acre private grounds within a 100-acre park with a beautiful carp fishing lake. Stunning panoramic views over peaceful rolling countryside enable you to watch incredible sunsets, also seen from the swimming pool and terrace. The swimming pool is only shared with FJD003. The holiday house has exposed beams, a magnificent decorative stone fireplace and stone pillars in the grand living room. There is a large country kitchen/dining room and a lovely outdoor covered terrace dining/sitting area. Walk or cycle up to a small shop for bread and essentials, a small restaurant and indoor tennis court in St. Aubin-du-Plain. A perfect place for walking, cycling, fishing, birdwatching and abundant wildlife. A horse riding school is 1 mile; 4 miles away is Argenton-les-Vallées with a beautiful lakeside restaurant, boating, kayaking, supermarket and international karting circuit. The large château town of Bressuire is 10 minutes' drive with two hypermarkets, shops, restaurants, bowling and an international tennis club. Puy-de-Fou, Doué Zoo, Saumur, Le Cadre Noir (horse riding display) and Pescalis are 30-40 minutes' drive. Within easy reach of the Vendée beaches for a day's outing. This beautiful villa is made from brick or stone. The agent has rated it as a four star property so it is a well-equipped villa with above average furnishings. It is also great value for money. 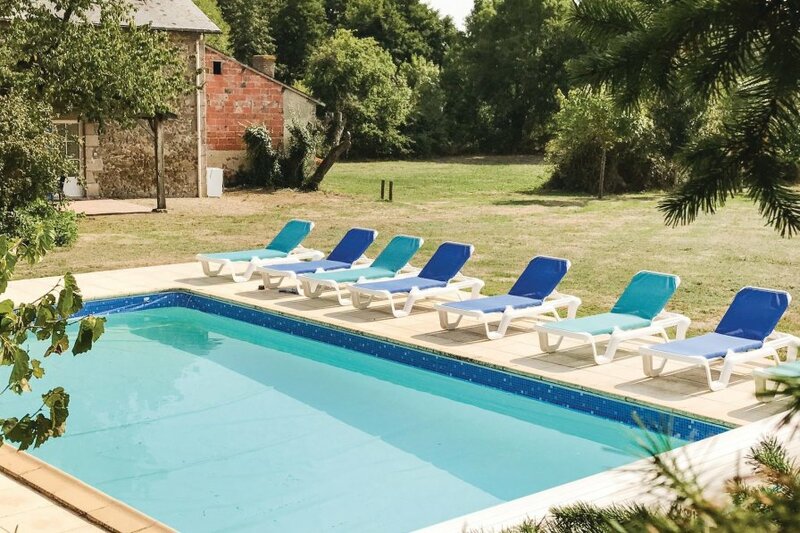 This villa has use of a shared pool and is located in Saint-Aubin-du-Plain. It is set in a good location: there is a restaurant 2km away.